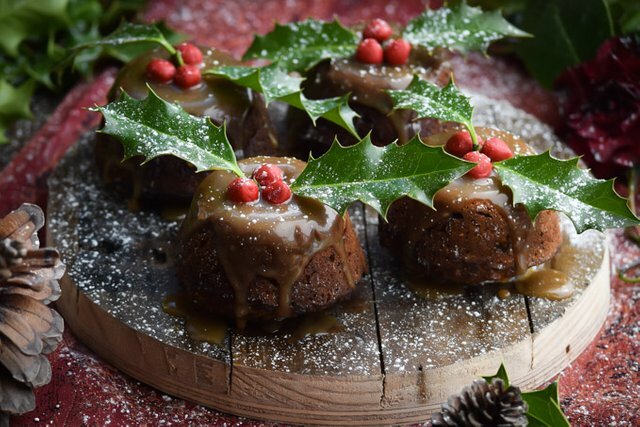 Toasted Pecan Gingerbread Figgy Puddings - FOOD PHOTO SHOOTsteemCreated with Sketch. I brought you some figgy pudding, I brought you some figgy pudding! Please tell me I’m not the only one who grew up listening to that line in the lyrics of We Wish You a Merry Christmas and picturing a bowl of purple custard. Anyone? I kind of always felt like that line “we won’t go until we get some.” was a little demanding and that figgy pudding must be really something to merit it. There’s no way I can vouch for what you’ll think, but personally, I’m pretty happy to say that it’s really good, or at least this here little version of mine seemed pretty good to me. You also have to keep in mind that the time period of this song, there weren’t 24-hour supermarkets open a few blocks away where you could swing by and grab a cake mix. No, they had limited resources and dried fruits were a novelty that most people reserved only for special occasions so no wonder they weren’t willing to leave without their figgy pudding. 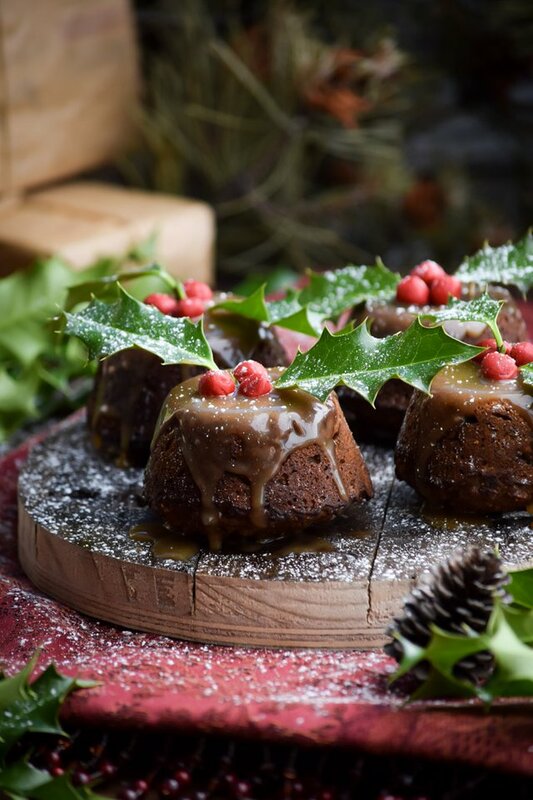 In essence, figgy pudding (and pretty much any pudding mentioned prior to this last century) is probably referring to a cake. A fruit cake actually, although there are more technical meanings of pudding depending on the time period. 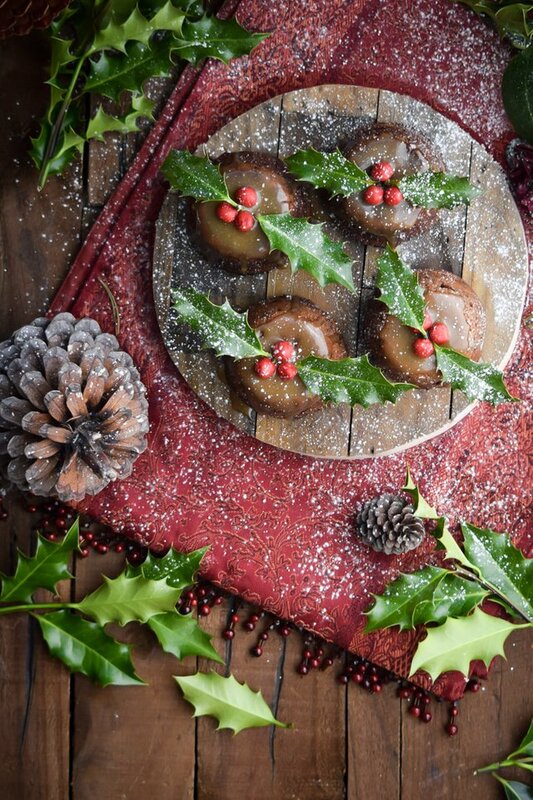 Traditionally they used things they had, dried fruits, dry breadcrumbs, some basic baking ingredients, and a touch of alcohol, to make a dessert that was affordable during the winter time. It’s a bit unusual in our modern Christmas dessert line-up but I have a thing for tasting historic foods in case you haven’t noticed. Of course, I should add the full disclaimer that this version I made is anything but traditional when compared to an old English recipe. I just wanted to try a similar idea to this age old dessert. As for the cute little toppings that are probably familiar to a lot of you, those are holly leaves. I felt so dumb when I went out in my own backyard and realized we have a huge holly tree that I have neglected to notice for this entire holiday season, what’s my problem! At least I figured it out for this post because these just wouldn’t look the same without them. The only thing is, it’s summer here, so there aren’t any berries on it and I decided to just use some leftover fondant from my gingerbread house for the “berries”. I had to put a ton of dye to get them red enough so I wouldn’t let anyone eat them, they were strictly for cosmetic purposes. But you have to admit that these look so classic, like they jumped right out of a Christmas Carol or Little Woman! Speaking of my gingerbread house guys, that’s part of what inspired the flavor of this recipe in case you hadn’t already guessed. I was going to use breadcrumbs but I just couldn’t justify it when I have so much leftover gingerbread around. I think it made these extra delish and so did toasting the pecans. And when I say “toasting” what I actually mean is frying. You see, the pecans get cooked with the oil for the recipe and the flavors just build on each other as you cook them, yum! Oh my goodness, and the glaze, wow! Just try not to start drinking it when the smell is wafting through your kitchen. If you make these, the glaze is a must! Okay, so I feel like I’ve completed just about every priority on my bucket list now that I know what figgy pudding is. Ha, sister jokingly asked me if I was going to make a cup of good cheer to go with this and I told her, “Don’t be silly, you know I and some of my readers aren’t 21 yet!” I did include a little alcohol in the recipe because it just feels so much more authentic that way. Like stepping into the age-old carols we hear every year with each bite. I understand for those of you who don’t want to add it though, so feel free to leave it out. However, the alcohol cooks off and also helps to soften the dried fruit, but it’s your choice. Hope you’re all having a great season! Merry Christmas eve eve (lol)!!!!! 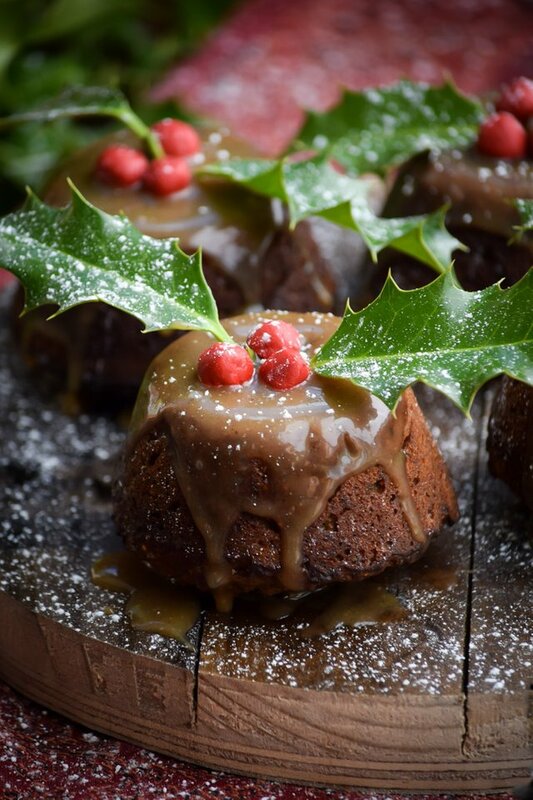 You've heard the name in so many Christmas songs but what the %$&# is "figgy pudding". I say you've got to try it to understand. 1/2 cup semi-sweet chocolate chips optional but delicious! Preheat oven to 350 degrees F (180 C) and grease two 6-cavity extra large muffin tins (see notes) with oil. Combine the brandy (if using) with figs, raisins, water, and 1 cup almond milk in a saucepan and bring to a boil over medium high heat. Boil for 5 minutes, then remove from heat and stir in baking soda. Cover with a lid and set aside to cool down. Put pecans and coconut oil into a medium saucepan and stir gently over low heat until completely melted. Increase heat to medium high and continue stirring for about 2 or 3 minutes, watching very carefully. As soon as the nuts start to smell fragrant and darken even the slightest, remove from heat and set aside to cool. Now back to the fig mixture, use a rubber spatula to scrape it all into a blender or food processor then blend until mostly smooth. Set aside. Now for the pudding. Pour the coconut oil and pecan mixture into a large mixing bowl and add sugar; stir until mixed. Add 3/4 cup more almond milk, lemon juice, baking powder, salt, zest, and vanilla. Mix well then scrape the figgy mixture into the bowl and stir until combined. Stir in flour and cookie crumbs then add chocolate chips. While the puddings are in the oven, add brown sugar, almond butter, almond ,milk, and salt to the same saucepan that you toasted/fried the nuts in and place over medium low heat. Bring just to a boil and cook, stirring gently, for about 1 minute until it starts to thicken. Remove from heat and stir in vanilla. 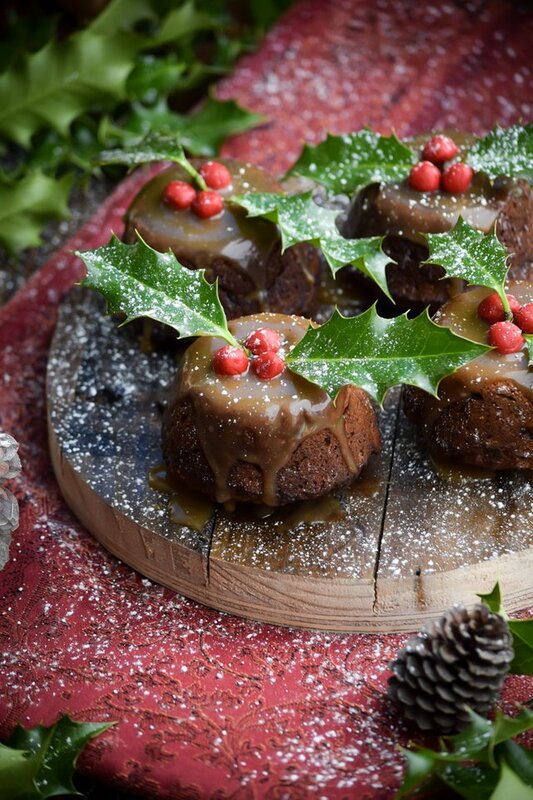 Allow it to cool for about 5 minutes then serve over puddings. If you prefer to use graham crackers or other packaged cookies but still want gingerbread flavor, just add 1 teaspoon cinnamon, 1 teaspoon ginger, and 1/2 teaspoon cloves to the batter. Also, obviously make sure that the cookies are vegan if needed. 2.If you don't have a large muffin tin this recipe can be baked in just about anything that's oven safe. You can use a loaf pan, a 13x9 pan, or even do micro puddings in regular cupcake pans (I've done that last one for a bigger group and they're sooooo cute!). Also, I've been starting to vlog in case you missed it. Hiking to Snow Creek Falls + I Hit 17k Followers! Christmas with ginger bread...delicious. Kind of saliva dripping too. I love it that you used holly leaves for this, it certainly would be the same without them, well done! 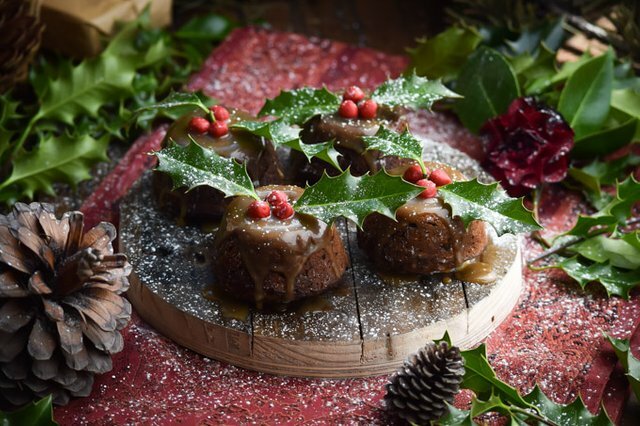 I thought that I had tasted all the traditional fare over the years but I have never heard of figgy pudding. One of my favourite fruits is the figs and this sounds delicious. Nice combination of photography and article. Very attractive!! !